Following on from my post about my hair appointment with Leo Bancroft, I really can't stop thinking about hair styles, looking at people's haircuts, and browsing the internet for ideas. A lot of you suggested I be brave and tell Leo to do what he wants with my hair... which I really want to do, although I would have to give him a few rules to stick to! I would only let him go so short, I think it would be a bit too much of a shock to the system if he chopped it all off. I wish I was brave enough, because I would love to rock hair like Frankie Sanford... although I'm not too sure it would suit me. I think in reality, the shortest I would be happy going, would be something like this... Jessica who made it to the final 18 on Great British Hairdresser had amazing hair. I love how the front is slightly longer than the rest, its kind of like a graduated bob with a twist, and my favourite thing about her hair is that she still manages to add a lot of texture and volume despite it being short. This is probably my favourite style I have found so far. Sorry the pictures aren't great, I took them off my tv using my phone. 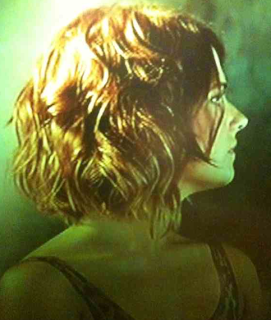 It kind of reminds me of a roughed up version of when Amanda Holden had her hair cut shorter... which I also loved! A slightly longer, probably more 'me' cut, would be something like when Cheryl Cole took out her hair extensions. I think this is the best style Cheryl has possibly ever had. I also love Fearne Cotton's hair at the moment, still on the longer side, but to me, this would feel quite short! I really really love that one off the Great British Hairdresser! & Cheryl Cole's too! I think you'd really like Shenae Grimes (Annie Wilson on 90210) haircut. It's a little longer than Fearne Cotton's. I love Jessica's hair. I'd noticed it myself, it's the kind of shorter style I'd get if I dared to go short. Can't see me doing that anytime soon though. I like the first look best! I L-O-V-E the girl from GBH's hair! It's really like Annie's (Shanae Grimes') from 90210.